Traditional and tasty Easter treats will be on sale at Target. You can currently browse the Target Ad Preview on scans or digital. Both of them are available right now. Target Easter egg sale and chocolate treats appear on the first pages. Buy Egg hunt candy for only $9.99 at Target. Chocolate bags of top brands like Lindt and Ghirardelli, gift cards, phone accessories, and many more products are available on pg 2-3. Buy DVD movies like Trolls for only $8! Enjoy the hunt with colorful Easter baskets. 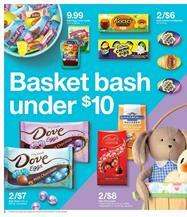 Buy Easter baskets for $2, berry basket for $1. Redecorate your table or living room for a celebration party or gathering. Spritz grass and eggs will cost under $1.50. Fill the baskets with arts and crafts items. Let the children enjoy the colors and collectible toys. Fans will find cool character toys in this Target Ad Preview of Easter sale. Find Target COUPONs on pg 6. Get a $10 or $25 discount on your purchases of $50 - $100 on games and toys. 20% off family or kids' games at Target stores. Buy Fornite Squad mode core figures for $39.99! Discover new products, too. NERF Fortnite micro shots is a new toy at Target. Pay only $9.99 to get that one. Slime, Play-Doh, Barbie, Disney toys are the range of toys on pg 8-9. LEGO fans can also find great sets. Superheroes are LEGO toys at Target Easter sale. Free $10 gift card for your $50 purchase of LEGO. Buy bikes, toy houses, Disney ride-ons, Tic Tac Toss, NFL ball, Spalding NBA ball, and many more items. You can also fill your bucket with kids' books. The Story of Easter and more books are available on pg 12. New movies at Target Ad. Subscribe to the Target Ad to get emails. Follow our Facebook page where we share these posts.